WebClientPrint for ASP.NET is a lightweight and plugin-free solution for Client-side Printing scenarios for Windows, Linux, Raspberry Pi (Linux ARM) & Mac clients, exclusively designed for ASP.NET MVC & WebForms website projects. With our WebClientPrint solution, you can easily send raw data, text and native commands to printers installed at the client machine without showing or displaying any print dialog box! You can also print common file formats like PDF, TXT, DOC, XLS, JPG, PNG, TIFF (Multipage), and many more! Any Client platform can print from your ASP.NET Website. We support Windows, macOS / OS X, Linux & Raspberry Pi (Linux ARM) devices. Very small footprint clients without external dependencies! Send any raw data supported by the client printer like Epson ESC/P, HP PCL, PostScript, Zebra ZPL and Eltron EPL, and more!. Shipping labels generated by postal services like UPS, FedEx, USPS, DHL as well as PRN files are also supported! Print PDF files without requiring Adobe Reader or any other external software! Advanced Printing settings include Tray Name, Paper Size, Print Rotation, Pages Range, and more! In addition to print raw commands, you can also use WebClientPrint solution to send and print known file formats like TXT, DOC/x, XLS/x, JPG, PNG, TIFF (Multipage), and more! TXT, PNG, JPG and BMP are natively supported; others will require external software like Word, Excel, LibreOffice, etc. Print to any brand and type of client printers! Thermal Label Barcode printers, POS receipt printers, Impact printers, Ticket printers, RFID printers, Dot-Matrix and more! Besides getting the list of installed printers available in the client machine, you can also get further details like DPI Resolution, PortName, Is Connected, Is Shared, Is Local, Is Network, as well as the list of supported Papers and list of trays/bins! Client Printers Connectivity support: installed Windows printers (for USB connection), Shared Printers, Parallel Port (LPT) or Serial Port RS-232 (COM) as well as IP/Ethernet Network printers. On Linux & Mac OS, any kind of printer installed through CUPS is supported. Use "the Default printer" of the client machine. Printing will be performed without displaying any dialog! Use "a specific installed printer's name" on the client machine. Printing will be performed without displaying any dialog! This also applies for Shared Printers on the client machine network with a UNC name/path! And the commands or files you want to print or send to the client printer. It is the WebClientPrint Processor (WCPP) utility that needs to be installed at the client machine just once. WCPP is a lightweight native app (without any dependencies) that processes all the "Client Print Jobs" generated by the server-side component. Raw Printing (a.k.a. "Raw Data Printing", "DOS-Mode Printing", "Line-Mode Printing") is the process of sending a stream of bytes (sometimes simple ASCII characters) directly to the target printer hardware. Those bytes are expressed by following the syntax and rules of the Command Language (a.k.a. Programming Language) supported by the target printer. Some Raw Printing Languages are composed of human-readable ASCII characters (like Zebra ZPL, EPL, etc) while others combine them with non-printable characters like is the case of the famous ESC/P, Postscript and PCL languages. Our WebClientPrint allows you to send those commands to your clients' printers from ASP.NET websites through an elegant and simple plugin-free approach. WebClientPrint does support any kind of printers! That means you can print and send raw commands from your ASP.NET website to any brand of Thermal Label Barcode printers, POS receipt printers, Impact printers, Ticket printers, RFID printers, Dot-Matrix printers, Kiosk printers, Cash Drawers/Registers, Slip printers, Multifunction printers, ID Card printers, Wristband printers, Passbook or Bankbook printers, Kitchen printers, Laser printers and Inkjet printers installed or available at the client machine. WebClientPrint does support local installed printers with the correct driver or the "Generic / Text Only" driver built-in Windows (for USB connection), Shared Networks printers with a UNC name, printers directly connected to Parallel Port (e.g. LPT1) Centronics or Serial Port RS-232 (e.g. COM1) as well as IP/Ethernet Network printers (e.g. DNS printer name + Port 9001). On Linux, Raspberry Pi & Mac OS, WebClientPrint leverages built-in CUPS system so any kind of printer installed through CUPS is supported. 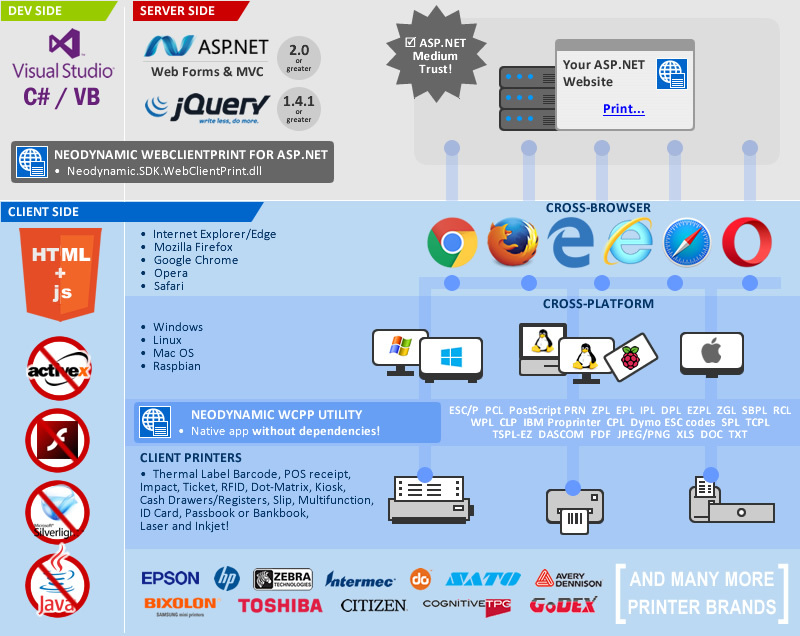 You can use WebClientPrint in your ASP.NET website for sending and printing any printer programming languages like Epson ESC/P, HP PCL, PostScript, Zebra ZPL and Eltron EPL, Zebra XML-enabled format, Intermec IPL, Datamax-O'Neil DPL, Godex EZPL, Printronix ZGL, SATO SBPL, Avery-Dennison (Monarch) RCL, Wasp WPL, Citizen CLP, IBM Proprinter, Cognitive-TPG CPL, Dymo ESC codes, Samsung-Bixolon ESC/POS codes and SPL, TOSHIBA-TEC TCPL, TSC TSPL-EZ, DASCOM, etc. In fact, any other printer languages that can be expressed as an array of bytes are supported! Of course, you can also print ZPL or EPL shipping labels generated by postal services like UPS, FedEx, USPS, DHL, etc. In addition to native printer commands, you can also print PRN files! Print ESC/POS Print Zebra ZPL Print Zebra EPL Try Online Demo! Print Common File Formats like Word docs, Excel sheets, PDF, TIFF and other images! In addition to print native commands, you can also use WebClientPrint solution to send and print common file formats like PDF, TXT, DOC, XLS, JPG, PNG, TIFF (Multipage), and so on. And by using the PrintFileGroup class, you can now printer multiple types of files to different printers available at the client machine! Print PDF Print Word Doc Print Excel Spreadsheet Print RDLC Reports Print Crystal Report Try Online Demo! Use low-cost fast printers with ASP.NET web apps and save money! Keep using your low-cost printer with ASP.NET web apps and save money! Have you invested money in fast and low-cost printing solutions? Maybe you have a lot of dot-matrix, impact, thermal printers? You'd like your web-based software (ERP, SCM, EAM, etc.) can take advantage of such printing technology but browser's printing functionality is a no-go? Yes, we know about it and that's why we're bringing to you the WebClientPrint solution. By using WebClientPrint for your ASP.NET printing needs, you can keep your printing costs low and your old hardware (Windows & Linux PCs and printers) are not outdated! Many legacy DOS or Windows Point Of Sale (POS) Systems are not ported to web apps technologies because raw printing with POS printers (like dot-matrix, ticket receipt, thermal, impact) is not fast, clean and simple when using the browser's printing functionality. WebClientPrint fills that gap and is the ultimate solution you can leverage for raw and fast printing in ASP.NET. So keep your low-cost printing hardware and move your old DOS or Windows POS system to ASP.NET with confidence! Can be used in any .NET Language such as C#, VB.NET, Managed C++, etc. Client Printers Connectivity support: installed Windows printers (for USB connection), Shared Printers on the client machine network with a UNC name/path, printers connected to Parallel Port (e.g. LPT1) Centronics or Serial Port RS-232 (e.g. COM1) as well as IP/Ethernet Network printers. On Linux & Mac OS, any kind of printer installed through CUPS is supported. Print Common File Formats! PDF, TXT, XLS, XLSX, DOC, DOCX, JPEG, PNG and many more! Any other IDE or Tool for developing ASP.NET 2.0+ websites.